This plant came to my full attention when it recently flowered. Of course I had to find out more and started research which turned up stories on historical plant collections, tequila production, semelparity in reproduction, and the ethnobotany of the agave. I also established a ‘flower watch’ regimen in June and started featuring the plant on many public tours. Its genus name, Agave, is from the Greek word agauos, which means noble or admirable. The species is named in honor of Charles C. Parry (1823-1890), a member of the US and Mexico border survey between 1848-1855, who worked as a surgeon and botanist. In the latter profession, he identified and named many plants native to the area – including the Torrey pine and Englemann spruce. So we can’t know what year it was actually planted between 1987 and 1999; it could have lived in a container for some time before being installed in the rockery above the parking lot. 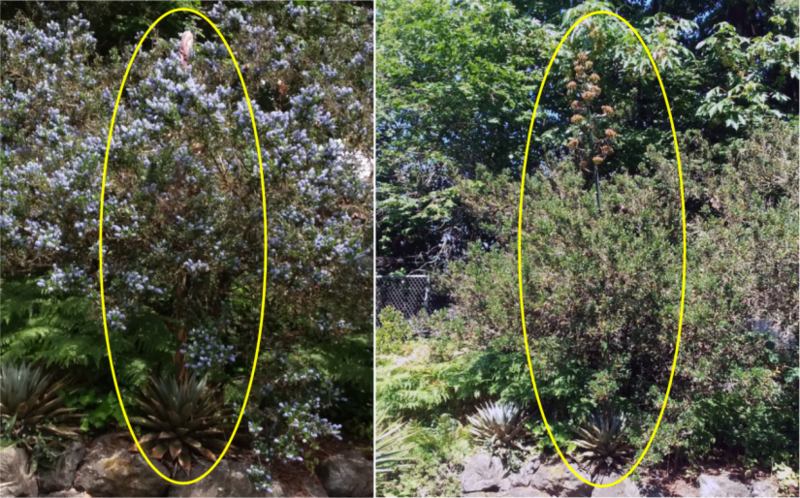 Over the years a neighboring Ceanothus shrub has grown to shade over the agaves underneath. 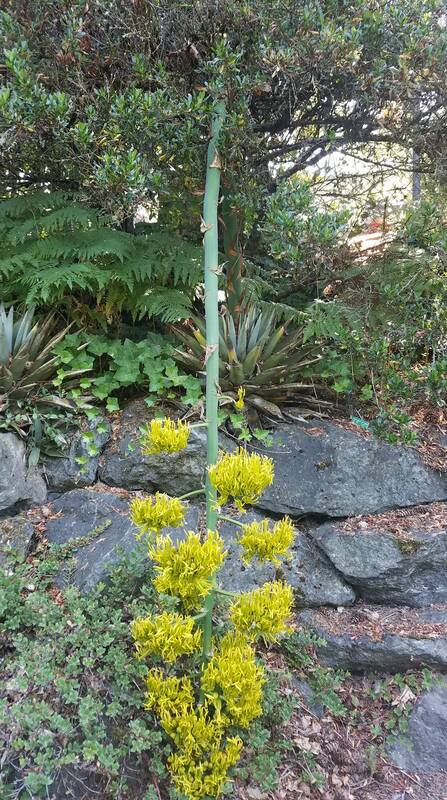 Roy Farrow, UW Botanic Gardens’ horticulture supervisor, has kept the shrub pruned back so the agaves underneath receive as much light as possible, but other than that he says the plants were pretty maintenance free. I have long admired its attractive blue-gray evergreen leaves (to 12” long with spiny margins and a 1” terminal spine) which form a symmetrical basal rosette – as the leaves unfurl from the center, the impression of the leaf unfurling is left on each leaf underneath. This impression adds an attractive texture to each leaf. 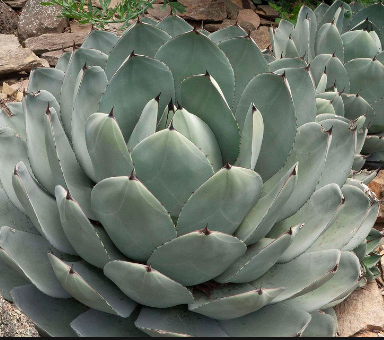 Agave can reproduce vegetatively by suckers/offsets which root at the base of the rosette forming over time a colony of rosettes – just as we see in hens and chicks sedums. It can also reproduce by seed, but only once and then the plant dies. This is called semelparity. Semelparity in plant reproduction is not unusual. Bamboo, hens and chicks sedums, and most grasses are semelparous. Many animals also reproduce through semelparity including octopi and salmon. The agaves usually flower between 10-15 years old but sometimes flowering will not occur until 20-30 years of age. At the ripe old age of 31-32 our Agave parryi went to bloom this last spring! The stalk was about 15’ tall and shot up through the neighboring Ceanothus shrub, towering 6’ above the shrub top. Before the flowers unfurled, it looked just like a giant asparagus stalk. This was the point at which my attention was piqued, I began researching agave reproduction, and following the plant’s progress on a weekly basis. Left: May 29, 2019. Note the pinkish bud tip of the agave stalk poking through the top of the flowering Ceanothus shrub. Right: June 19, 2019. Flower stalk fully extended, buds have not yet opened. As I watched the progress of the flowering and began to learn about semelparity, I became slightly obsessed with and proud of our agave. It bloomed in late June/early July, and as the gorgeous flowers broke bud and spread their orangey-yellow petals, it was truly spectacular. Agave parryi flower stalk on July 11, 2018. After it had fallen over due to the weight of the flowers. One Sunday in July I went to visit the agave and found to my dismay the flower stalk fallen over, bent about 4’ up the stem. The top of the stalk was almost touching the ground below the retaining wall with the flowers were facing downward. I was certain that was the end. Roy decided to leave the stalk as it was rather than attempt to stake it up and possible break it. When I returned next Sunday – the flowers had completely turned 180 degrees, were facing up to the sun and continued to mature afterwards. After the flowers were done, the seed pods began to engorge and the leaves of the basal rosette turned brown and began to wither. My research on the agave shows the flowers are usually night-pollinated by bats and moths, but they can self-pollinate as well. Since there was not another flowering agave near by it was questionable if the seed would be viable. 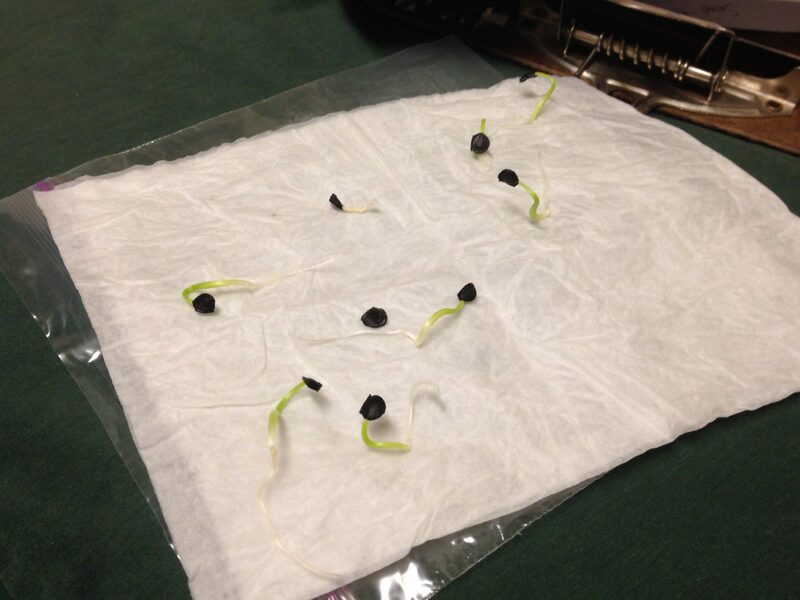 A germination experiment by a volunteer guide using seed collected from a pod fallen to the ground achieved successful germination. Agave parryi seeds after germination. One could conclude that the flowers self pollinated, but I am not an expert nor a botanist so can make no final definitive statement about this. The rest of the seed pods were harvested from the plant last week and their future use has not been decided yet. These agaves have an interesting ethnobotanical history as well. Archaeology has shown that going back at least 9,000 years agaves have been a source of human food, medicine, fiber for baskets and clothing, and a beverage. Of course, the most famous use of Agave parryi is the liquor mezcal. This process takes several steps beginning when the agave’s central bud is removed. This leaves a cavity, which fills with nutritious fluid called aguamiel (translation = honey water). When the aguamiel is allowed to ferment it becomes an alcoholic beverage called pulque, and when pulque is distilled it becomes mezcal (which technically can be distilled anywhere). Tequila is a high quality mezcal produced only from Agave tequilana grown in limited regions of Mexico. Size: 1-2’ tall by 2’-3’ wide. Flower stalks can be 20’ tall. Historical use: alcohol production of pulque and mezcal. Native Americans used this agave species as a source of food, fiber, soap and medicine. Cacti, Agaves and Yuccas of California and Nevada, 2008, Ingram. Growing Succulent Plants, 1987, Graham. The Economy of Nature: Data Analysis Update, 2007, 5th edition, pp 212-13, Ricklefs. Thx for the in depth article about the Agave. I’ve seen it many times with you during the tours. I had an Agave parryi in a container in a container. Rather than put it in my clay soil where it would most likely die, I gave it to a friend who was thrilled!